Dorothy Mae Hyduke, 87, passed away Monday, April 8, 2019. Born in Garwood, NJ, she lived in Clark for 66 years. Friends are invited to visit 4-8 PM Friday at the Dooley Funeral Home, 218 North Ave. West in Cranford. Interment services will be 1030 AM Saturday in the mausoleum of St. Gertrude Cemetery, 53 Inman Ave., Colonia. An avid bingo player, as a resident of Avalon Assisted Living, she ran the king in the corner card games and assisted her friends in the memory unit. 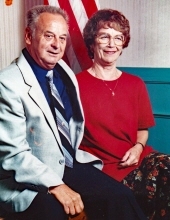 Mom loved to play cards, mini-golf, and take care of her husband of 66 years. Surviving are three devoted children, Michael Hyduke, Janet Kozik (John), Diane Fitzpatrick (Mike) and four beloved grandsons, Justin, Sean, James and Brian. To send flowers or a remembrance gift to the family of Dorothy Mae Hyduke, please visit our Tribute Store. "Email Address" would like to share the life celebration of Dorothy Mae Hyduke. Click on the "link" to go to share a favorite memory or leave a condolence message for the family.